The next name of Rashtrapati Bhawan occupant, India’s 14th President will be announced around 5 pm. While the counting of ballots for the presidential election will begin at 11 am on July 20th, 2017, Thursday. The ballot boxes of Parliament House will open and start counts in the alphabetic order as first. There would be eight rounds of counting in the four separate tables. An Election Commission official has witnessed previous two presidential polls and they said usually results are declared around 5 pm. The 14th president will be selected based on the maximum votes by all state MPs and MLAs for the NDA’s nominee Ram Nath Kovind and the opposition’s candidate, Meira Kumar. 06:40 pm: Amit Shah said: I firmly believe that his term will take the Post to greater heights & add more dignity to it. 05:47 pm: Prime Minister Narendra Modi meets President Elect Ram Nath Kovind. 05:35 pm: Senior BJP leader MM Joshi and Sushil Kumar also congratulated Kovind. 05:20 pm: Union Minister Nitin Gadkari, and Bihar Chief Minister Nitish Kumar congratulated Kovind. 05:03 pm: Ram Nath Kovind said: I had never thought that I would be elected as the President but the love for my nation has brought me here. I thank all who supported me from across country, I feel very emotional, I’ll represent all those struggling to make a living. I promise to serve the nation with all honesty. 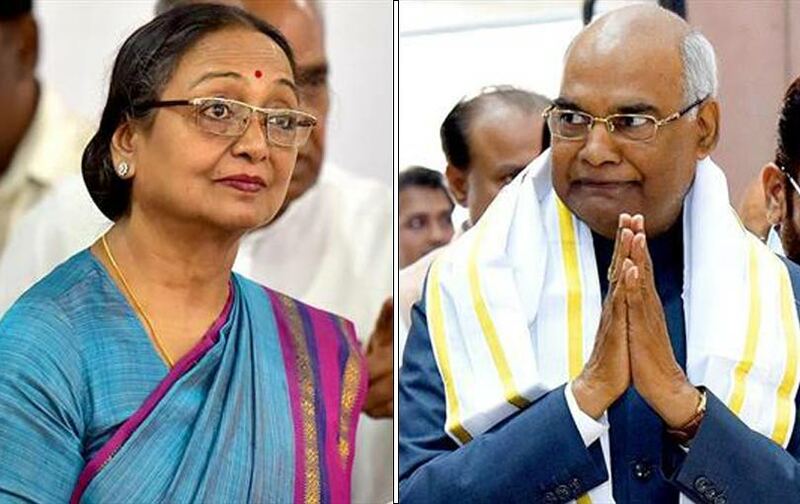 04:51 pm: Meira Kumar also congratulated the 14th President of India, Ram Nath Kovind. 04:49 pm: Ram Nath Kovind thanked and congratulated opposition candidate Meira Kumar. He said that this is an emotional moment for me today. 04:45 pm: Amit Shah said: Congratulations to Shri Ram Nath Kovind ji for emphatic victory in the 2017 Presidential elections. His victory is truly historic. 04:44 pm: Followed by Pm Modi, Amit Shah congratulated Ram Nath Kovind. 04:31 pm: PM Modi said: Congratulations to Shri Ram Nath Kovind Ji on being elected the President of India! Best wishes for a fruitful & inspiring tenure. Gladdened by the extensive support for Shri Ram Nath Kovind Ji among MPs & across various states. I thank members of the electoral college. I also congratulate Meira Kumar Ji for her campaign, which was in spirit of the democratic ethos & values we all are proud of. 04:30 pm: Prime Minister Narendra Modi congratulated Ram Nath Kovind. 04:15 pm: It’s official that Ram Nath Kovind will be the second Dalit President of the country after KR Narayanan. 04:05 pm: Kovind crosses over 7 lakh votes while Meira Kumar stuck with around 3.6 lakh votes. 02:16 pm: Ram Nath Kovind led by getting 60,683 votes over Meira Kumar’s 22,941 votes. 02:15 pm: Counting is over in four states of Andhra, Assam, Arunachal, and Bihar. 02:10 pm: The votes are being counted and there will be eight rounds of counting. 02:05 pm: Meira Kumar: I am not upset, why should I be upset? I am a fighter, I fought for the belief and faith of the majority of my countrymen and women. 01:30 pm: NDA candidate Ram Nath Kovind leads by 1 lakh votes. 11.50 am: The counting is underway in the Parliament which votes polled in the presidential election 2017. 11:15 am: Counting started with the first box of Parliament House. Then will gin with the alphabet order as Andhra and Assam. 11:10 am: The Counting agents of BJP are Suresh Angadi, Ganesh Singh & Gajendra Shekhawat. Opposition nominee Meira Kumar said before on her voting on Monday as this election was a battle of ideologies and not caste. (Next president of India from the Dalit caste after KR Narayanan). On Wednesday, the Chief Minister Mamata Banerjee in Kolkata had thanked all Opposition parties for supporting Meira Kumar. On July 19th Wednesday, the NCP leader Praful Patel had said that “All MPs don’t necessarily vote only according to conscience, they also vote according to party lines, and party lines are divided somewhat on ideology, principles and political positioning” in New Delhi. On July 17th Monday, the Prime Minister Narendra Modi went to the Parliament House and he was the first, who cast vote. There are totally 4,896 voters (4,120 MLAs and 776 elected MPs) were eligible. The MLCs of states with the legislative council are not part of the electoral college. According to the report, the following states had cast 100 per cent vote in this Presidential election. Assam, Bihar, Chhattisgarh, Arunachal Pradesh, Gujarat, Himachal Pradesh, Haryana, Jharkhand, Uttarakhand and Puducherry. The values of MLAs and MPs votes are equal to the population of the concerned states in the country.